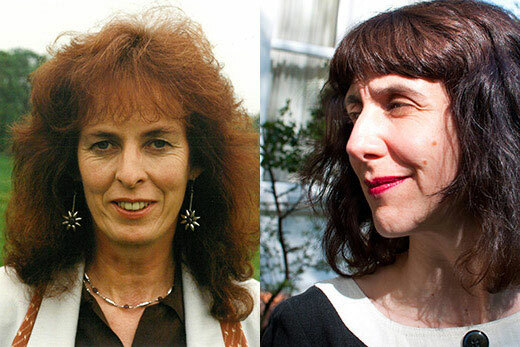 Irish poets Rita Ann Higgins (left) and Sinéad Morrissey will read at Emory on March 27 and April 3, respectively. Higgins photo from the Rita Ann Higgins papers, Rose Library at Emory University; Morrissey photo by Malachi O'Doherty/Blue Flower. Irish poets Rita Ann Higgins and Sinéad Morrissey are scheduled to visit Emory University this spring to give readings from their work at the university’s Stuart A. Rose Manuscript, Archives and Rare Book Library. The readings, free and open to the public, celebrate Women’s History Month in March and National Poetry Month in April. Rita Ann Higgins will read on Tuesday, March 27, at 5 p.m. as part of the Raymond Danowski Poetry Library Reading Series. Register here to attend this event. A playwright and activist as well as a poet, Higgins is known for her wry commentary on economic and gender inequities. The Galway-born author has penned 10 volumes of poetry, including “Witch in the Bushes” (1988), “Philomena's Revenge” (1992), “Sunny Side Plucked” (1996), “Ireland Is Changing Mother” (2011) and “Tongulish” (2016). She published an autobiographical volume of essays and poetry, “Hurting God,” in 2010. The Higgins reading is sponsored by Irish Studies at Emory, the Hightower Fund and the Rose Library, which holds her papers. The Higgins papers were fully processed and opened for research in 2017. Sinéad Morrissey will share her work a week later, on Tuesday, April 3, at 5:30 p.m. Register here to attend this event. Raised in Belfast during the Troubles, Morrissey has received a number of accolades over the years. She won her first award, the Patrick Kavanagh Poetry Award, in 1990 when she was just 18 years old. Morrissey’s published works include “There Was Fire in Vancouver” (1996), “The State of the Prisons” (2005), “Through the Square Window” (2009), “Parallax” (2013), winner of the T.S. Eliot Prize, and “On Balance” (2017), which netted her the Forward Poetry Prize for Best Collection. The Morrissey reading is sponsored by Irish Studies at Emory, the Creative Writing Program and the Department of English, with additional support from the Center for Creativity and the Arts and the Rose Library. “We are pleased to welcome these two Irish poets to the Rose Library to share their work and connect with the thriving Irish village at Emory,” says Rose Library interim director Jennifer Meehan, referring to the phrase coined by poet Eamon Grennan about the library’s Irish literary collections. The Rose Library is located on Level 10 of Emory University’s Woodruff Library, 540 Asbury Circle in Atlanta, 30322. For disability-related accommodations at these readings, please contact Emory Libraries events manager Maya Cody in advance at 404-727-7620 or maya.cody@emory.edu.